Burdwan is an anglicised version of the Sanskrit Vardhamana and the corresponding Bardhaman in Bengali. The origin of this name dates back to sixth century BC and is ascribed to the twenty-fourth Jain Tirthankar, or Vardhamanswami, who spent some time in Astikagrama, according to the the Jain Kalpasutra. This place has been renamed as Vardhamana in his honour. A second view holds the literal meaning of the name, a prosperous and growing centre, to argue that this place represented a frontier colony of the progress of aryanisation through the upper Ganga valley. However, the Aryans failed to proceed further east. So, the name was retained. Archeological evidences suggest that this region, forming a major part of Radh Bengal, could be traced even back to 4000-2000 BC. Burdwan is a place of mixed culture. The deuls (temples of rekha type) found here are quite reminiscent of Buddhist architecture. The various mosques and tombs remind us of Muslim culture. The old temples bear signs of Hinduism, mostly belonging to the Sakta and Vaishnava community. The famous Sufi Pir Baharam's tomb is here. The controversy on Kankaleswari Kali of whether it originally belonged to the Jains or Tantriks indicates again the town's multifaceted heritage. Indeed, Burdwan had witnessed, experienced and withstood quite a few historical thunderstorms in the past, mainly due to the Mughal, Pathan and Maratha intruders. The town of Bardhaman was visited at one time or another by many a notable of the Delhi Empire from Raja Todarmal to Daud Karnani, from Sher Afgan and Kutub-ud-din to Ajimuswan or the rebel Sheh Jahan. The celebrated tombs of Sher Afgan and Kutub-ud-din lying side by side in this township relate to a classic love-story of Mihr-ul-Nissa and Jehangir that made Sher Afgan, the first husband of the great lady, a dead third person. The lady, who once lived here, later ruled India as Jehangir's wife for quite sometime, but with a new name Noor Jahan (Light of the World) commensurate with her beauty and culture. 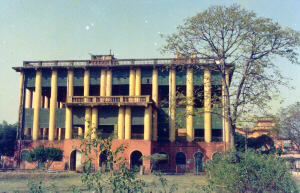 Burdwan's present panoramic view and modernisation owe mainly to the Raj family. The Burdwan Raj started with Sangam Rai, a Khattri Kapur of Kotti in Lahore, who established the Burdwan House. The year 1657 recorded this Raj first. Among the descendents, Mahtab Chand Bahadur and later Bijoy Chand Mahtab struggled their best to make this region culturally, economically and ecologically healthier. Sadhaka Kamalakanta as composer of devotional songs and Kashiram Das as a poet and translator of the great Mahabharata were possibly the best products of such an endeavour. The society at large also continued to gain the fruits. We find, among others, the great rebellious poet Kazi Nazrul Islam and Kala-azar-famed U. N. Brahmachari as the relatively recent illustrious sons of this soil. The town became an important center of North-Indian classical music as well. The famous Shrine of Sarvamangala, said to contain the remnant of Sati's body, is situated here. Aside this, there are quite a number of temples and Sivalingams. Here lies the big Curzon Gate built in honour of the visit of Lord Curzon. Burdwan is a town of tanks. Several tanks are scattered here and there across the town. These caught the attention of Victor Jacauemont, a young French natural scientist, who visited this town in November, 1829. According to him Hindus and Muslims all took their bath in these tanks. Burdwan is quite rich with its agricultural products, with rice and potato heading the list, so much so that it is called Bengal's granary. Damodar and Ajay are two main rivers here. The mineral resources include coal, iron ore, fireclay, silica and moulding sand. Some of these accelerated the process of industrialisation around its northwestern belt. Sitabhoga and mihidana are two famous sweets of Burdwan, introduced first in honour of the Raj family. The locality has remained serene over the years. People of varying religions, castes and cultures live here in perfect harmony. The climate is pleasant. The temperature of the zone normally lies between 8 to 30 degrees centigrade. Burdwan University started on 15th June, 1960, with Sukumar Sen, an ICS, as its first Vice-chancellor. It was after the abolition of the Zamindari system in the fifties that Uday Chand Mahtab, the last representative of the Burdwan Raj, showed his magnanimity in leaving almost his entire property of Burdwan at the disposal of the state government. This, coupled with the initiative of the then Chief Minister of West Bengal, Dr. Bidhan Chandra Roy, facilitated the establishment of this university. Presently, the administrative works are mostly done at Rajbati (the palace of Barddhamana Maharaja) campus; on the other hand, academic activities center around the Golapbag campus mainly. At the initial phase, only the humanities section began to funcion. After a year, mainstreams of science faculties were included. The starting motto, that this university should have a science-technology bias, in view of the growing needs of industrialisation just around, later found justification when Medical College and Regional Engineering College, Durgapur took shape. There are now about 22 Post-graduate departments in various disciplines. With regard to further expansions, mention may be made of the engineering college, named as University Institute of Technology, which has recently been established under the direct control of this University with the approval from All India Council for Technical Education (AICTE). Academically, Burdwan University is feeding and nourishing more than 100 colleges. Its territorial jurisdiction extends over five districts - Burdwan, Hooghly (excluding Serampore Subdivision), Bankura, Birbhum and Purulia. These constitute the greater part of Radh Bengal, the cradle of ancient civilisation of India. The imprints of the past are strewn all over the Radh Bengal. The university is now in a position to offer courses on diverse disciplines. These include physical education, B.Ed., foreign languages, computer applications, population education, etc. There are also an Adult Continuing Education Center and the Academic Staff College. The university has a museum and art gallery at Rajbati that displays even the pottery of prehistoric age. The university has its Distance Education wing imparting Post-graduate education in different subjects as well as in some professional courses at Under-graduate level. With social responsibilities in mind, the university actively patronised the construction of a Science Centre and a Planetarium, named as Meghnad Saha Planetarium. The University has established a Rural Technology Centre in the name of Shri Binoy Krishna Choudhury, the ex-minister of the Government of West Bengal, to impart vocational training and to create scope of self-employment for the rural youth. There are plans for building up of a center of creative art also.